Notice how damaged the brass is - Brasso strikes again! But restoration is probably still possible in the right hands. 20896 Private Albert Carpenter of the 9th Battalion, the Devonshire Regiment. Son of Robert and Sarah Carpenter. Born in Oakford in 1890. Died 1 July 1916 aged 26. 2796 Lance Corporal William Sydney Davey of the 2nd Battalion, the Gloucestershire Regiment. Son of George and Elizabeth Davey. Born in Cadbury in 1880. Died 10 May 1915 aged 34. 29526 Gunner (George) Frederick Gater of the 104th Heavy Battery, the Royal Garrison Artillery. Son of George and Sarah Gater. Born in Cadeleigh 7th September 1879 - lived in Tiverton. Died in Kut 30 April 1916 aged 36. 235174 Private George Greenslade of the 11th Battalion the Leicestershire Regiment. Son of George and Lucy Greenslade.of Bickleigh; husband of Florence Greenslade of Coombe, Cadbury. Born in Tiverton in 1893. Died 15 September 1917 aged 24. P/17694 Private William Henry Matthews ("Harry"). He enlisted in the Royal Marine Light Infantry in Plymouth but was transferred to the Royual Marine Depot at Deal where he died. Son of Frederick and Emily Matthews of Silverton. Born in 1897. Died of disease 25 January 1915 aged 18. Buried in the civil cemetery, Deal, Kent. 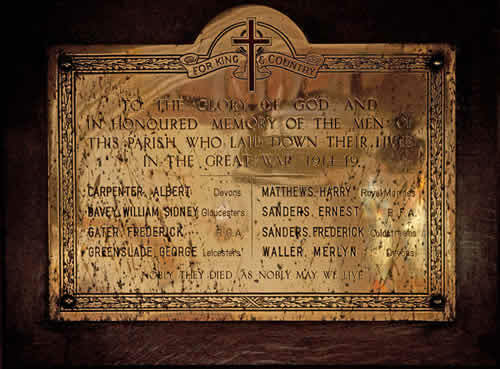 39629 Private Ernest Saunders of the Royal Garrison Artillery; attached to the 336th Battery, the Royal Field Artillery.Grandson of Mary Saunders (w). Born in Bridford in 1895.Died 13 September 1915 aged 20. 9920 Private Frederick Saunders of the 4th Reserve Battalion, the Coldstream Guards. Son of Edwin and Mary Ann Saunders. Born in Cadbury in 1892. Died 11 November 1914 aged 21. 23111 Private Merlyn Waller of the 9th Battalion, the Devonshire Regiment. Son of Thomas and Ellen Waller. Born in Cadeleigh in 1896. Died between 4 and 6 September 1916 aged 20.